Twitter recently expanded to allow users to up their character limit of their tweets to 280. 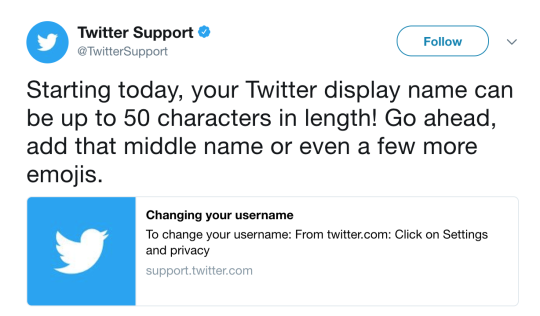 The social network has now announced that your display name can run up to 50 characters in length. Your username appears in your profile URL and is unique to you. It’s used for logging in. Your display name is a personal identifier (sometimes a business name or real name) displayed in your profile page and used to identify you to friends, especially if your username is something other than your name or business name. Change your name by following instructions here.